Hi, is there any compatible cartridges for the HP Colour LaserJet CP4525xh printer please? Cartridge Save is the foremost mail order provider of toners for HP CP4525-xh laser printers within Great Britain! It is our goal to provide nothing less than top quality toners. If you want the entire selection of laser printer cartridges that are proven to be compatible with the CP4525-xh laser toner printer, shop at Cartridge Save! We are excited about supplying exceptional affordable prices and efficient customer care. You will receive complimentary overnight delivery for everything bought from Cartridge Save. Cartridge Save are extremely committed to quick delivery, with 98% of purchases arriving the following day. In order to give you far more security, every HP CP4525xh laser printer cartridge you purchase on our shop has a extensive cash-back guarantee. Order the highest quality toner cartridges at a reduced price only on Cartridge Save! The HP Colour LaserJet CP4525xh is a workhorse laser jet printer ideal for small to medium sized companies with high-volume requirements. This printer comes with a large paper handling capacity and quick print speeds. The HP CP4525xh printer supports both Macintosh and Windows computers and has built-in Ethernet for easy networking among workgroups. The HP Colour LaserJet Enterprise CP4525xh does not have built-in Wi-Fi and has an expensive initial cost. 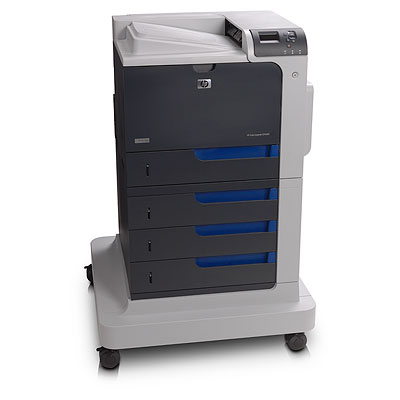 The HP CP4525xh Colour LaserJet is a laser printer stacked on 5 paper trays. A stand with wheels is at the bottom. For connectivity, USB and Ethernet ports are located at the back. The LCD display and control panel beside the output tray is easy-to-use. The HP CP4525xh colour laser printer has a maximum print resolution of 1200 x 1200 dpi and print speeds of up to 42 ppm for both black and white and coloured. The printer has dimensions of 26.1 x 5.7 x 38 inches and weighs 141.1lbs. The Colour LaserJet Enterprise CP-4525xh is a workhorse printer that is well-built and very reliable in an office environment. The HP CP4525xh Colour LaserJet Enterprise printer has an automatic duplexer to help reduce paper waste in the office plus has a monthly duty cycle of 120,000 pages. Users can expect high quality output on a consistent basis from the HP CP4525xh laser printer. There are other laser printers that are cheaper than the HP Colour LaserJet CP4525xh but might not live up to its speed, quality, and paper handling. The Colour LaserJet CP4525xh printer could have been better if it had built-in Wi-Fi.